Report from Transmediale 2002 | JONAH BRUCKER-COHEN, PH.D. Report from Transmediale 2002 – JONAH BRUCKER-COHEN, PH.D.
On Tuesday, February 5th, Berlin’s Haus De Kulturen de Welt (International House of Cultures) was transformed from a bland, concrete convention center to a scene from Kubrick’s 2001. 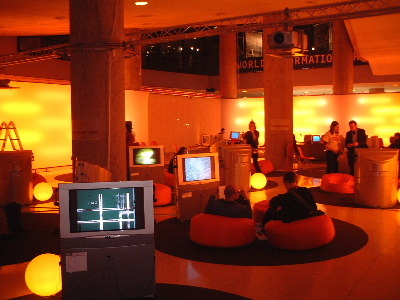 Day-Glo orange beanbags filled the “Media Lounge” along with multiple computers and screening stations for projects showing at the Transmediale 2002. Neon lights lit up the stretched nylon wrapper surrounding the lounge while cloth banners filled the entrance hall hanging like rubber flaps of a space-age car wash. The opening night began with introductions from the festival’s two organizers and curators Susanne Jaschko and Andreas Broeckmann. Despite there being a simultaneous English translation available, I found out too late and missed most of their comments. Nevertheless, the evening led to a trailer of the featured digital animations and video pieces along with an introduction by Randall Packer, Secretary of the United States Department of Art and Technology. Mr. Packer, who started the USDAT to give international artists a voice in an increasingly defense-focused US government, gave his first European address modeled after Harry Truman’s famous address to congress. His cornerstone idea rests on the value of Global Virtualization as a unifying force for arts working with technology and their integration into the betterment of society and technological understanding among the world population. After the proceedings, I (USA) along with the other Ambassadors of their respective countries ratified the Berlin Virtualization Charter by signing our names on a Palm Pilot and beaming them to Mr. Packer’s master copy. Meanwhile downstairs, the Congress Hall of the building led into the exhibition floor where a wide variety of international media artists displayed their work. I was lucky enough to be included in the show with my personal bandwidth generating project, “Crank The Web” along with artists like Ohio State University’s Ken Rinaldo with his organic reactive sculpture, Autopoeisis, Montreal’s Luc Courchesne with his 360 degree immersive interactive panorama project, Masaki Fujihata’s 3D GPS narrative, Seiko Mikami’s eye tracking viewer, RobotLab’s mechanized DJ and scratching “Juke Bots,” and video/webcam installations such as Wolfgang Staehle’s “Empire 24/7” and Dagmar Keller and Martin Wittwer’s eerie video pan, “Say Hello to Pease and Tranquility.” Included in the exhibition but outside the museum-like walls and on the sidewalk outside the Haus, was Alexei Shulgin’s computer installation “Busking 386 DX.” It’s very uplifting to hear a 386 PC begging for money and singing “Should I Stay or Should I Go?” followed by a medley of Beatles songs. 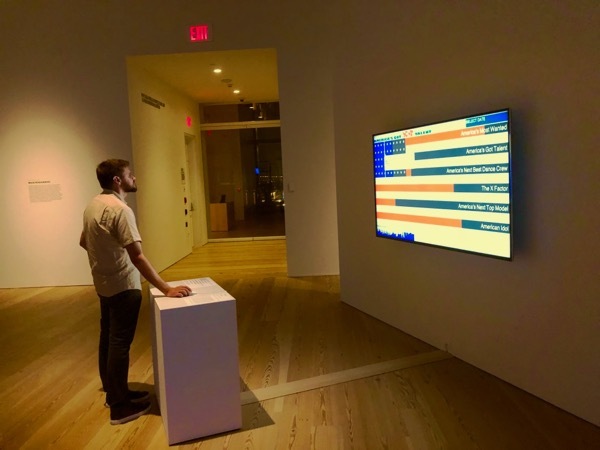 Although the festival award nominees were chosen before it opened, Transmediale commissioned artist Stuart Rosenberg to create a project for the audience to participate in the final tally. His work, “Public Bet/Public Vote” allowed audience members to bet Euros and vote on the projects they thought would win the awards. As the votes were tallied, the people closest to the correct winners would split the riches. As well as exhibition projects, there were plenty of online works in the show including the Carnivore project and a curious work called Tracenoizer where you input your name and it scours the web for your information eventually building a mock-website about you. Alongside the projects were numerous panels, discussions, workshops, and performances, and a nightly gathering called “Club Transmediale” consisting of DJs and live video mixing which took place in a local abandoned factory-turned-nightclub called E-Work. Courchesne, Fujihata, Rinaldo, Peter Frucht, RobotLab, and I began the panel proceedings with “Concepts of Interaction” moderated by Susanne Jaschko. Each of us got a chance to present our exhibited works along with past projects. Other workshops included an all day long seminar on “Hacker Techniques” as well as one on creating “Flash Comics.” Thursdays panel included one on SMS (Short Message Service) as a medium for artistic expression. Overall it was a really good festival with a lot of work to see and many conferences/talks to attend. This year’s fest benefitted from being in the Haus De Kulturen de Welt since it’s a bigger venue and allowed for more people and more attention spent on individual works. Hopefully, next year it will be even a bigger success!